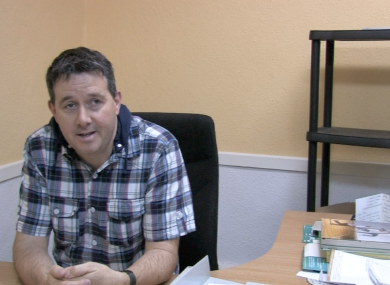 FORMER GREEN PARTY TD Paul Gogarty has said that that he is considering a move to Fianna Fail. The former Dublin-Mid West TD is no longer a paid-up member of the Green Party and is considering the move following a conversation with a local Fianna Fáil supporter while taking part in RTE’s ‘Celebrity Bainisteoir’. The FF supporter told Gogarty that if he ran in the next General Election under Fianna Fáil that he would get elected. Speaking to Jason Kennedy in the building that used to be his constituency office, Mr Gogarty said that the move to Fianna Fáil is one of three political routes that he is thinking of following. “I think Fianna Fáil have taken their kicking,” he said. “They have to move forward and learn from this. Fianna Fáil back in the fifties was a national movement. They represented the pulse of Ireland,” he said. I haven’t finished with the Greens. I am very much green to the core, but in terms of getting political objectives achieved, I have not made up my mind with, whether I will go back into politics, whether the Green Party has a chance to recover or whether we need a strong green element in some other organisation. The Lucan man also had some harsh words for the electorate, saying that some of them are “thick as hell”. He said: “There are some very intelligent people out there who think about how they make their voting arrangements and then put one, two, three in order and go all the way along the ballot paper. Then there are some really stupid people who vote for you for no real reason and they don’t think about it. Either because they know you or they like the look of you.” He added that people were “stupid enough to be taken in by the promises of Fine Gael and Labour”. Nowadays the controversial former TD says he is happy to have more time to spend with his family, develop his music and work as a journalist, which he was originally trained as. “It [life] has been a lot more relaxed and a lot less oppressive,” he said. Email “Paul Gogarty: I'm considering joining Fianna Fáil”. Feedback on “Paul Gogarty: I'm considering joining Fianna Fáil”.